UNESCO Biospheres are internationally recognised as special places for people and nature. In 2015 UNESCO designated Dublin Bay as a Biosphere because of its rare and internationally important habitats and species of wildlife. While many can enjoy the wildlife in the Dublin Bay area only a few have experienced the life underwater. The Dublin Bay UNESCO Biosphere partnership and the Irish Underwater Council want to raise awareness of our marine life and are calling for underwater photographers to share their Dublin Bay (Lambay to Dalkey) underwater/spilt shot images through entering a new photography competition. We will be displaying an exhibition of the best images around the Dublin Bay area so would love as many photographers as possible to enter in order to share our underwater world with the public. The ethos of the exhibition is to display the wide variety of marine life, so all levels of photography experience are encouraged to enter. The closing date for entries is the 20th of April 2018 and winners will be announced on the 4th of May. Dublin Bay Biosphere Partnership has sponsored €400 for the winning image in each category. There are also great runners up prizes thanks to Flagship Scuba, Lambay Diving Retail, Oceandivers Ireland, The Purty Kitchen, Seasearch Ireland and Diving Ireland. Email images to photosdublinbay@gmail.com. Images must be renamed with a Title and Category. Address, location of shot, marine subject, date and camera model must be included in the email. Images must be saved as JPEG of 1-2 MB. To ensure anonymous judging, do not include your copyright name in the image. The competition is open to all underwater photographers. The closing date is 20th April 2018. 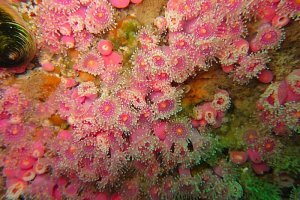 Photographs must be taken underwater in Dublin Bay (between Lambay and Dalkey) Photographs do not need to be recent. Up to five photographs per person can be entered. Entrants agree that their photographs can be used as part of an exhibition around Dublin Bay, displayed on placards in prominent seafront areas and/or on social media. Material may also be used in Biosphere promotional/reporting material. Basic image editing is allowed (e.g. cropping, global adjustments to saturation, exposure, white balance etc. ), but nothing should be added to the image. All entrants must respect the marine environment when taking pictures. Any entrant failing to follow the rules will be disqualified. The organisers reserve the right to alter the rules if it benefits the fair running of the competition. Compact camera definition: small-sensor cameras excluding those with lenses interchangeable with the body of the camera (housing mounted wet lenses allowed). Action cameras, for example GoPro range, also included. Cameras falling outside of the category include Digital Single Lens Reflex (DSLR), compact cameras with lenses interchangeable with the body of the camera, medium & large format sensor compact cameras (FX, DX, APS-C, micro 4/3rds, 1 inch sensor). e.g. Nikon D7100, Olympus OMD E-M1, Sony Cyber-Shot RX100 series and compact cameras with full frame sensor e.g. Sony Cyber-Shot RX1. Dublin Bay Biosphere Partnership would like to display a wide variety of Dublin Bay underwater species in the exhibition so if you would like to share images outside of those entered in the competition we would welcome these. To find out more about the Dublin Bay UNESCO Biosphere visit www.dublinbaybiosphere.ie.